Life can be of your own making or thrust upon you by circumstance, but it is still the life you have to live. Yates contrasts different versions of a difficult life with one another, showing both the best and worst of what humanity has to offer. She develops the plot of her story with emotion and imagination to create a whole that pairs romance with coming to grips with the past in an unforgettable way. 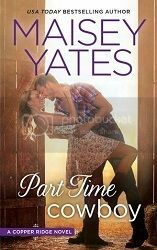 The unforgettable way that Yates brings her characters to life makes everything very real for the reader. At the same time, she also shows the humour in life. I definitely laughed more than once while reading this. Everything is balanced, the good with the bad, in this romantically explosive novel. The vast array of complex characters that we meet in this novel was great. Eli was a complexly contradictory character. All gruff and hard on the outside, caring and worried on the inside, to the extent that he couldn’t fit together the pieces of his life if they didn’t turn out how he’d expected them to. Sadie’s past is something that she must come to grips with in order to move forward and have a meaningful relationship. I found myself both wanting to be these characters, and experience the explosive chemistry that they had along with the unforgettable romance that they found, while also thanking my lucky stars that I didn’t have to live through the heart wrenching grief that they’d experienced. Many of the secondary characters in this novel were just as compelling. I enjoyed getting to know them, and definitely can’t wait to revisit with them later in the series. This one was definitely in-damned-possible to put down. The characters and plot meshed in the perfect way, creating an unforgettable novel that contrasts the joys of romance with the harsh realities of life that we don’t always want to think about. At the same time, Yates made me laugh, repeatedly throughout. This is a fantastic novel, and one that every romance lover should read.